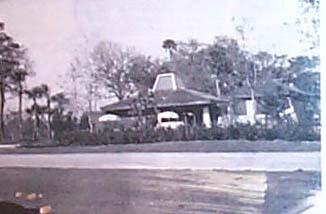 The Original Palm Coast Golf Clubs' 19th Hole - Pro Shop - Restaurant/Bar Dining Room on the present Cooper Lane. This Polaroid Picture was taken by us during the 'Guided Tour' offered by ITT Levitt where ITT Levitt, later ICDC , showed us and all Prospective Buyers what Amenities they would get if they purchased here. We recently saw that this area was also somehow strangely SOLD; then supposed/reportedly bartered or some such, but is awaiting future Hi Rise/ Hi Density. This makes no sense, we all were showen THIS specific location, with this Specific Golf Course Clubhouse on this specific parcel. We all were shown the putting green behind it, and adjacent to that the Boat To Golf Dock specific areas. The area at the back of this Polaroid was the Parking Lot, and the specific parcel set aside and promoted as the Driving Range. This also apprears to strangely have been somehow SOLD? This Concrete, Block and Stucoo Building was later 'Rehabbed' and enlarged with Concrete, Block, Stucco , and Coquina Stone Hi Columned Entrances ( front and right side) by H. Bratloff Construction. 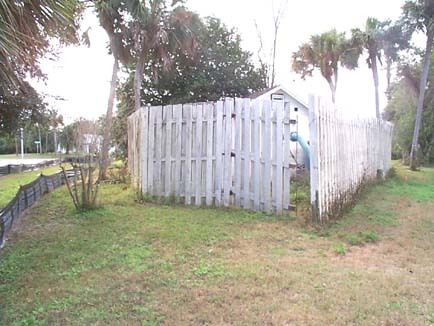 Prior to this Building 'towntalk' and 'townmeetings' occurred at the first Child's and Neighborhood Park in Palm Coast. 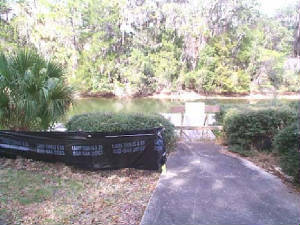 Another Monument was MOVED was across the street far away from the Golf Course Waterway Feature. ITT Levitt / ITT told us the C.& R's were recorded along with the Streets and General Area and was 'designated and recorded'. 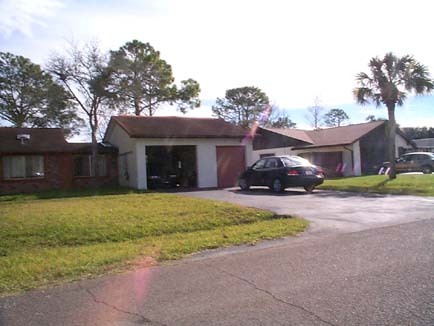 We signed the Florida Offering Statement in 1971 and in the area of 'Land Use' it stated that this was a residential area; and Multi -Family areas were designated and 'Recorded'. Please Note the Park and Clubhouse Locations in this Area' No Condos in this Aerial View. 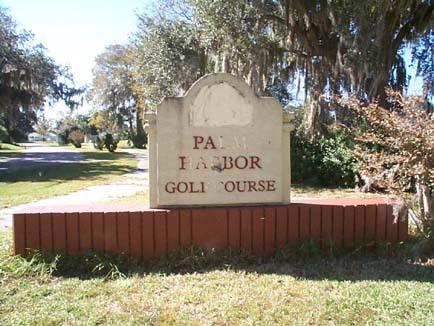 Location of The Palm Coast Golf Club a.k.a Palm Harbor Golf Course ' 19th Hole and Pro Shop 2008'. Further destruction, January 2009, at this specific location of the C.B.Stucco Clubhouse we were shown on the 'Company's ' official Guided Tour. The wood chips and logs are the result of chain saw; most probably when digging in the Large Pond and/or hacking down so many large trees in and around the Driving Range area. Yet More Oak Tree Hacking down; atop where our promised and pledg 'Contemporary Clubhouse' once was. This was the rear of the 19th Hole. Note the Screened Area there which once built, was later used for the Pioneers Towntalk and Townmeetings as the Second Site for Towntalk and Townmeetings. It was great since it was roofed and Colonel Lynn Wickland didn't have to '..Oyez Oyez Oyez .....Bring a Chair...' any longer. 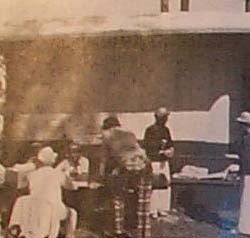 This view of the ' 19th ' Hole shows the tables and chairs that we allowed to use for Palm Coasts' Towntalk and TownMeetings. This was the Second Location for the Original Pioneers to meet; the first location being the first Neighborhood and Childs Playground and Park area. 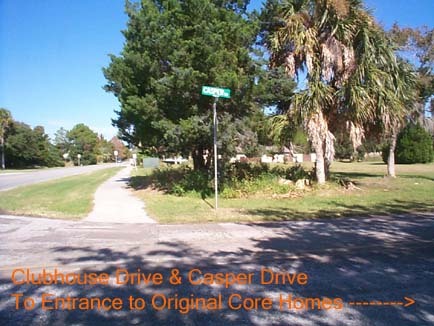 This Neighborhood and Childs Playground and Park Area is across the street from 30 Casper Drive on Cooper Lane. Please note - you can see the outlines of tables and chairs; overhead were many paddle fans to make this area more enjoyable for 'town talk' and 'town meetings'. These Golfers most probably were coming from their own personal watercraft to sign up and play Golf. This view is from the rear of the Clubhouse, tho', from their perspective it is the front, neat huh ! The Putting Green is to their left. This is what Prospective Buyers were shown by the official 'Guided Tour' offered by 'The Company, ITT Levitt, later ITT ICDC . 1974 - Palm Coast Golf Club Scoreboard taken during the 'Tournament of Champions'. 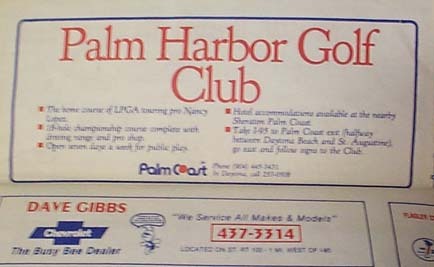 The Palm Coast Golf Club was very important because it was the site of many Social Functions. 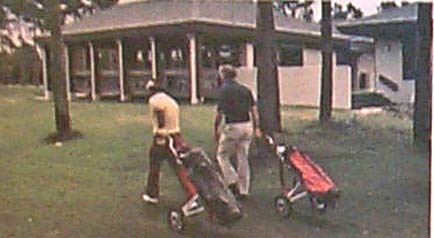 1974 was the first year of professional golf competition in Palm Coast. It was called the 'Palm Coast Open'. In 1975 it became the 'Tournament of Champions'. 2008 Palm Harbor Golf Course 19th Hole. Please note upper left, the proximity of the Original Core Homes via the short extention of Cooper Lane. We paid a Premium Price for this Premium Lot area. 1. Location and proximity to the Swim Club, Main Canal, Tennis Club, Boat Ramp, Yacht Club and Marina, Boat to Golf Dock at the Golf Course, Golf Course Clubhouse, etc. 2. Closer Proximity to the Palm Coast Golf Course. 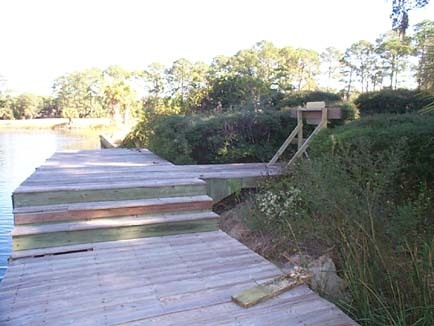 e. 'Boat to Golf Dock' adjacent to the Putting Green and Clubhouse. 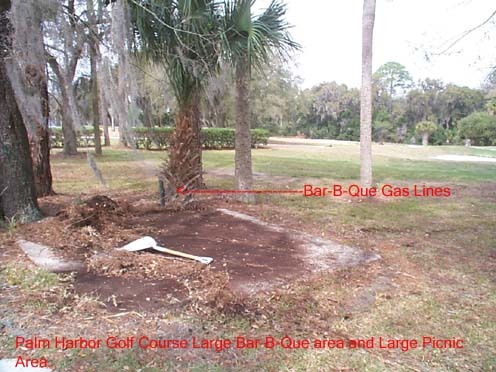 f. Very Large Golf Course Bar-B-Que Area with adjacent very large Pic-Nic Area - Note Gas Lines for the Bar-B-Que Area we once had. 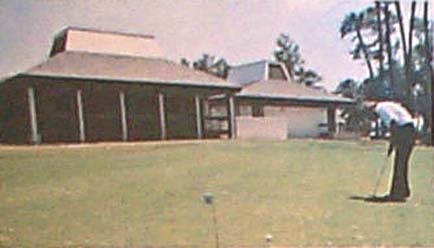 We're told our large Bar-B-Que Area and Large Pic-Nic Area adjacent to the Golf Course Waterway Feature was somehow strangely sold so we don't have these promised Feature Anymore. g. Palm Coasts' First Neighborhood Park on the east side of Cooper Lane near the intersection of Clark Lane and Cooper Lane. 3. Core Homes are able to have their own owned Golf Cart since many of us were Golfers. 4. Personally, we were thinking telescopically for retirement planning. How convenient to have your own Golf Cart. As with everyone, we would have to surrender our drivers licenses; consequently we could use our own Golf Cart to traverse only just a little way to the little store or the 19th Hole to get some bread and milk and to have some social, thereby keeping our dignity, mobility, and independence longer, making the transition to a Nursing Home less abrupt. The Developer told us that the C&R's severability clauses would ensure this. At/Around 1975/1976, further confirmation was sent to the Pioneers; that an 'Agreement' had been reached with the Developer and the FTC. Amongst other things, the Developer in a synopsis reported that the 'Agreement' with the ' FTC ' contained conservation and preservation conditions, etc. More specifically, Federal Trade Commission Decisions, Volume 88, July 1, 1976 - December 31, 1976, Findings, Opinions, and Orders, C-2854 Docket # for International Telephone and Telegraph Corporation et. al. - 933(pg). As an aside, Al Emilian, 22 Clark Lane, surrendered his Drivers License. He and his wife gave their Buick and the Porsche he was restoring to their children. He and his wife used a Golf Cart to get a little bread and milk, occasionally stopping in with us and other neighbors for a little 'social'. He later developed Alzheimers and she would drive the Golf Cart for the basic errands. It is most probable also that Potential Buyers seeing the Golf Carts go back and forth from private residences to the Golf Course 'nailed' many a Sale for the Developer. This Premium Feature was in effect for decades. . Many of us that owned our own Golf Carts stored and charged them in two or one car garages or in front of their car on their Carports. Some Core Residents built this 'Golf Cart' Garage to house and charge the batteries on their Golf Carts. This area was designated and recorded, advertised and promoted, as Golf Course, Recreation...we do not know what all was contained within the 'Agreement' that was made with the FTC - Federal Trade Commission in 1975 - 1976 so we will let the furture Doctoral Candidates and Researches inquire into all this - Some components in the FTC 'AGREEMENT' can be seen in the previous pages. This is a wide angle view of the Palm Coast Golf Course a.k.a. Palm Harbor Golf Course. It is taken from the Golf Carts' Path looking towards the Pumphouse Building. Behind the PumpHouse Building is Casper Drive. 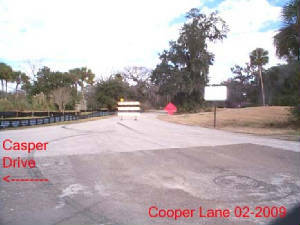 To the left, background is the intersection of Casper Drive and Cooper Lane. This Building and Fenced areas was apparently somehow SOLD too? Close up of the Palm Coast Golf Course a.k.a. Palm Harbor Golf Course' feence and C.B.S. Pumphouse. Note the Feeder Line; the street intersection signpost of Casper Drive and Clubhouse Drive for reference Points. Apparently this was somehow Sold? 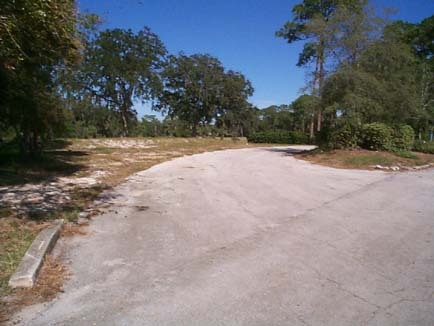 The intersection above was where we once had our 'Entrance Sign' stating: Palm Coast Golf Course. 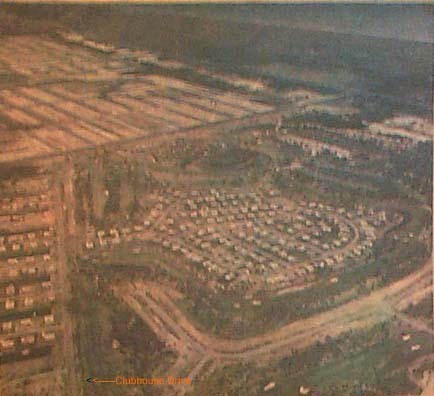 Later it became Palm Harbor Golf Course. It was made of Concrete, Block, and Stucco and 'Highlighted' the Core Area and the Golf Course Area. It was the Entrance to both the Core Neighborhood and the Golf Course. It appears this parcel has also been SOLD? Additionally, it appears the parcel on the other side of Casper Drive, across from this parcel was also Sold. Regretably, this , once developed with contradict the conservation and preservation 'openness' of our Neighborhood. We don't know how it was allowed to be SOLD since it is referenced in the F.T.C. Consent Agreement. 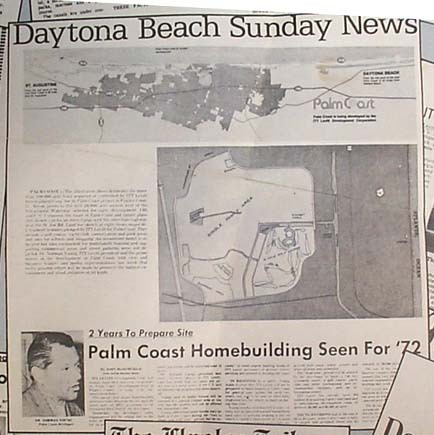 Additionally, with NO MARKER, our Area is not un-identifiable and now a less valued Location from its original design and original Intent of Palm Coast. Offering Pledges showed FULL Golf Course and Beach Club Motel. Article above comes from ITT Levitt Advertising, from a Newspaper Collage Grouping making ONE Ad. major development features pledged by ITT Levitt for Palm Coast. They include a Golf Course, Yacht Club, conservation and park areas and sites for schools and shopping. An Oceanfront Motel is indicated but sites earmarked for multifamily housing and supporting commercial areas and street patterns were not depicted . Br. Norman Young, ITT Levitt president and the prime mover in the development of Palm Coast told civic and business leaders and media representatives last week that every possible effort will be made to preserve the natural environment and avoid pollution of all kinda. 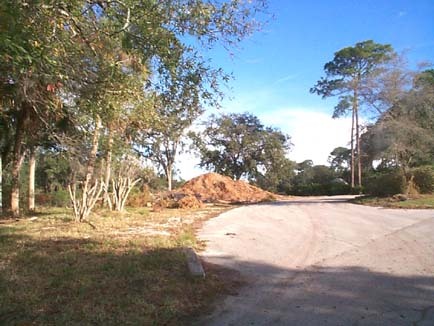 In Response to a query Young made it clear that ITT Levitt will not be prepared to build homes in Palm Coast for general sale witin the next two years nor will it be able to offer fully improved lots for others to build on during that time. Young emphasized that ITT Levitt efforts will be directed toward installment land sales to persons seeking a site on which to build a retirement or vacation home. 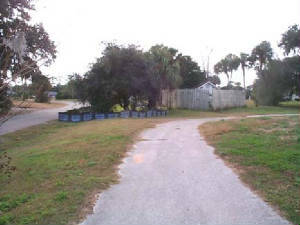 when Palm Coast is fully pmproved with roads, water sewers and other utilities and amenities. The "lead time' period will be utilized by the developer to build a 150 unit oceanside motel, a golf course, yacht club and other recreational and environmental favilities, and an information center. From: ITT Levitt AD 2531. Please Note the location of the Beach Club, the 150 unit Beach Motel pledged by tITT Levitt. It is labelled on the extreme middle right of the above Presentation. Open seven days a week for Public Play. 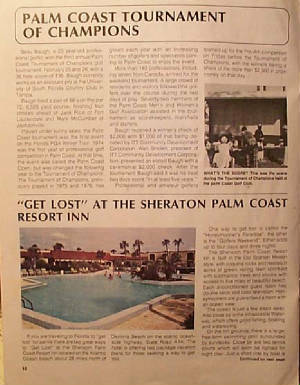 "Get Lost" at the Sheraton Palm Coast resort Inn If you are traveling to Florida to get lost for awhile there are two great ways to Get Lost at the Sheraton Palm Coast Resort Inn located on the Atlantic Ocean beach about 28 miles north of Daytona Beach on the scenic oceanside highway, State Road A1A. The hotel is offering two package vacation plans for those seeking a way to get lost. One way to get lost is called the Honeymooners' Paradise the other is the Golfers Weekend. Either adds up to four days and three nights. The Sheraton Palm Coast Resort Inn is built in the Old Spanish Missionstyle, with coquina rocks and nestled in acres of green , rolling lawn sprinkled with subtropical trees and shrubs with access to five miles of beautiful beach. Each airconditioned guest room has double beds and color television. Honeymooners are guaranteed a room with an ocean view. The Palm Coaster, Summer 1978, pp. 10-11. 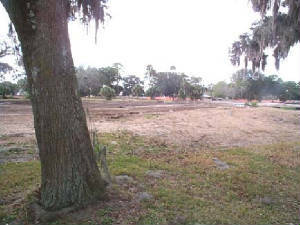 Work has begun on the Palm Harbor Golf Course and progress is visible. 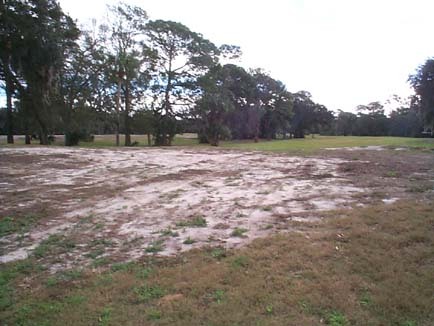 Palm Coast, Florida – December 18, 2008 – The Friends of Golf has issued an update for its members detailing construction progress on the City of Palm Coast's recently acquired golf course. The course was "gifted" to the city by Centex as part of an agreement facilitating Centex's departure from the local area. Centex had closed the course, planning to refurbish it as part of a larger condominium and hotel project. The project stalled in the downturn of the real estate market. The communication from the Friends of Golf is so complete, I'll simply reproduce it here as a public service for GoToby.com readers, with special thanks to the Friends of Golf. 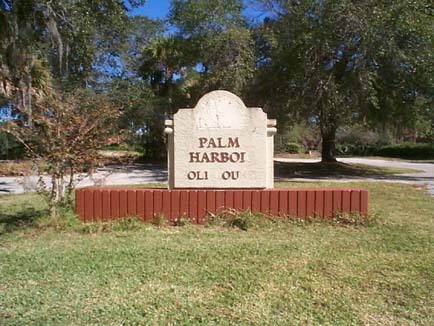 As you know, the City awarded contracts for the renovation of the Palm Harbor Golf Course in November. Work started several weeks ago. If your day took you over to Clubhouse Drive I'm sure you've seen the activity on the old 5th hole as well as 16, 17 & 18. The first stage was the killing of all the grass in anticipation of scraping all the old top soil. This was required to remove the old built-up organic material which would have impeded the growth of the new turf. The scraping has been done and you can see the result on old #5. The next step will be the rough shaping of the fairways, tees, greens and bunkers. Following that, the irrigation system will be installed followed by the final shaping and sprigging (planting grass). If you drive by #5, you may see that there are three strips which were not scraped. We asked and were told it was because of underground electrical cables. They'll be scraped by hand, a much safer operation. The dirt from the pond is being used to raise the 15th and 16th fairways to eliminate the drainage problems we used to experience. The view down the 15th fairway from the tee. Notice all the material being dumped on the left side. The 18th green had to be moved because of the Centex property line. Therefore, although the hole will play a bit shorter, the tee was moved back as well and some bunkers added on the right side to give "character". Here's a view down the 18th fairway from the tee. Notice the berms on the right side. Those will be the faces of the bunkers. The construction crew will be on a 2 week hiatus over the holidays and will be back at work after the 1st of the year. We’ve been assured that all is on schedule for a Labor Day opening. The City is in the final stages of selecting a management company and expects to approve a contract with the winning bidder at a City Council meeting shortly after the first of the new year. We do not know WHO these Friends of Golf People are....and they say '...the Golf Course was *gifted* by Centex..."
How can this be? How can WE be *gifted* for something we already paid ALOT for initially?